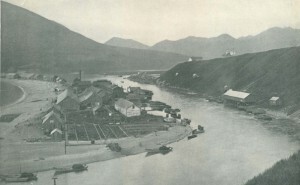 Canneries on Karluk Spit in 1898. Photo by Jefferson Moser. From “The Salmon and Salmon Fisheries of Alaska.” U.S. Fish Commission Bulletin for 1898. Washington DC, GPO, 1899, plate 53. The Alaska Historic Canneries Initiative is a grassroots effort launched in the fall of 2015 that promotes projects around Alaska that document, preserve, and educate about Alaska’s seafood industry. While the industry remains ecologically healthy and economically sound, the history of the industry is endangered. Hundreds of canneries, salteries, and herring plants once appeared in bays throughout coastal Alaska. Now, many slip into the sea before their stories are recorded. The seafood industry is critical to the livelihoods of many in Alaska and it is central to the state’s identity. It is time to document and preserve these places and record the stories of the fishermen and processors who define coastal Alaska. For more detailed information about the Alaska Historic Canneries Initiative, click here to view our brochure or see the October 2015 News Release about launching of the Alaska Historic Canneries Initiative. The initiative relies on the passion, the knowledge, and the efforts of individuals, businesses, and communities to instigate cannery history projects around the state. That means you! Below are examples of potential projects, some large, some small. But whatever the size, all advance the initiative’s vision: to improve stewardship of seafood industry history in Alaska.